Project management tools should make your life simpler, not endlessly complicated. When you’re managing a growing team, it’s easy to lose track of things. You may find yourself wondering where you stashed a document, digging through emails to see if you sent an invoice, or worrying that you didn’t remind a junior designer about a changed delivery date. You’ve downloaded a bunch of SaaS tools with the promise that the latest and greatest software is the key to your peace of mind. And it can be, if you make your tools talk to each other. 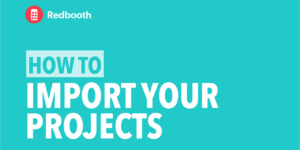 Think of your project workspace in Redbooth as your project home. You go to different tools to get things done, but the project begins and ends there, and is the place where it all comes together. When you use specialized tools for different jobs, you can scale up your project management. You’ll get the best tech for specific processes, making individual tasks easier and faster. You can update progress across time zones and devices, communicate with your team without hosting meetings, and keep track of what’s getting done where. 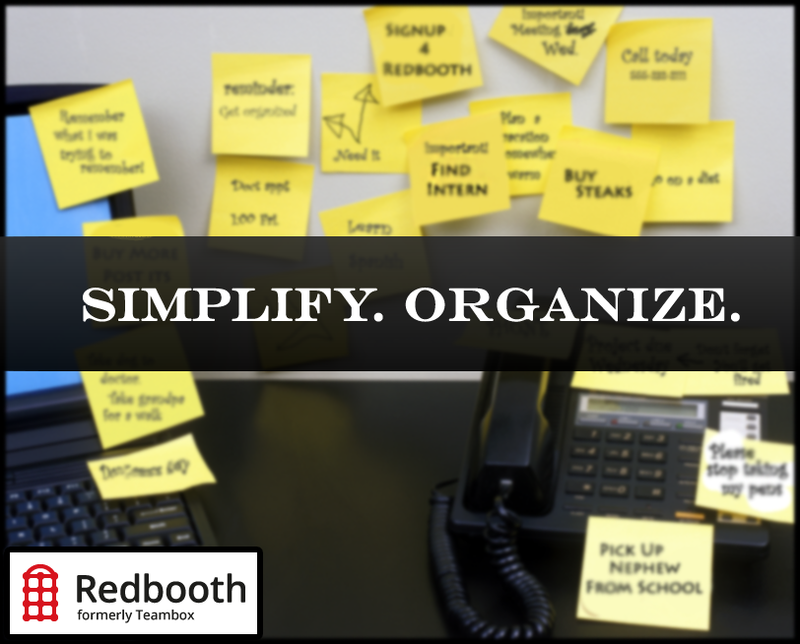 With Redbooth as your project home, there’s no limit to the ways you use tools to make your team more productive. You can use our grab-and-go integrations, set up automations with Zapier, and even develop your own project management tools with our API. Think of this as a practical guide to getting your team ready for project management at scale. It sometimes takes a village of project management tools to complete a project, but those tools are all working towards your project goals. Redbooth has tons of turn-key integrations with popular SaaS workflow tools to make sure every step of your project goes as smoothly as possible. Simply log in to Redbooth, go to “My Profile Settings” and select from these integrations. 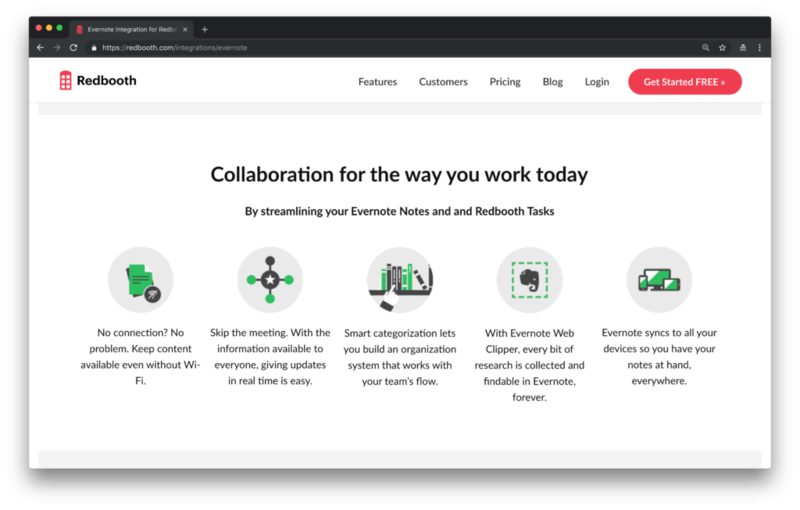 The Redbooth Evernote integration can help you get the creative process started, without having to worry about syncing up notes later. When working on projects asynchronously, or with a remote team, you want a way to quickly get everyone on the same page – literally. With the Evernote integration, you can automatically upload notes, lists, and other documents to your project workspace. It updates sync automatically and you can even search through your team’s documents and files to find exactly what you need when you need it. Email is the oldest project management tool. Staying on top of your inbox is vital when working on a fast-paced project with various stakeholders. Email integrations for Redbooth help you make email follow-up a breeze by allowing you to create tasks directly from your inbox. The Redbooth Gmail integration is a Chrome extension that works seamlessly with your Gmail account. When you receive an email, you can immediately turn that into a task named after the email subject field, and populated with the body text. You can also use the “Redbooth” action button in Gmail to create any task you want after picking from a drop-down of your existing workspaces. The Redbooth for Outlook plugin works in a similar way, enabling fast task creation directly from your inbox. You can create tasks from email threads, use the subject line of an email as the task title, the email body as the task description, and upload email attachments directly to your new Redbooth task. You can also select the workspace, task list, assignee, and due date within Outlook. With both email integrations, you can accomplish two goals at once: communicating quickly and taking action on your conversations. Your contacts will appreciate the efficient and reliable follow-through, and your inbox won’t be a source of dread. Redbooth integrates with the three most popular file storage apps to allow you to share your work in whatever format is most convenient for you, your team, and clients. The Redbooth Google Drive integration is free for all Redbooth users, and enables you to attach Google Docs and Sheets to real-time chats, tasks, and conversations within Redbooth. Your colleagues can access and edit the files, which makes collaboration easy. The Redbooth Dropbox integration is also available to all Redbooth users and makes it easy to insert Dropbox files into tasks and conversations in Redbooth. 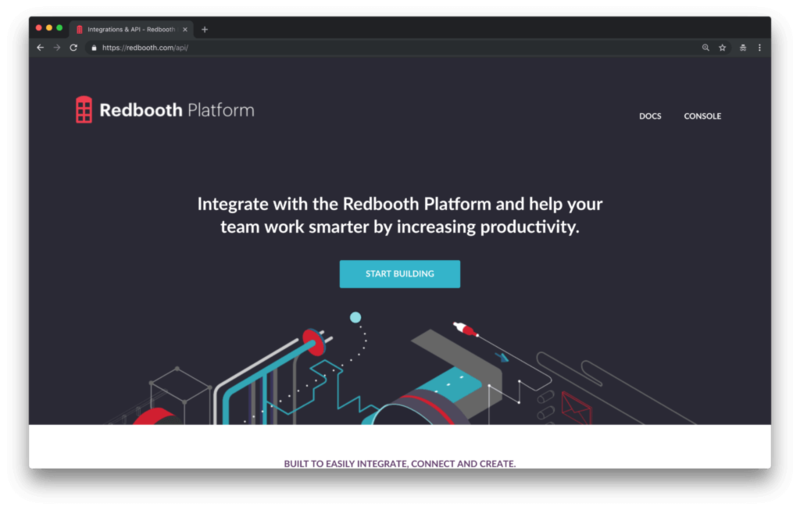 The Redbooth Box integration is available to Redbooth Pro, Business, and Enterprise customers. The integration allows teams to view and share files from Box, upload files to Redbooth workspaces, edit Box files without leaving Redbooth, manage file permissions for your team, and sync file updates instantly across devices. Placing files directly in your project workspace means you don’t have to go switching between apps all the time. You can reference work that is right in front of you and easy for everyone to see. Team chat is the fastest way to get someone’s attention, ask questions, and get answers about a project. Integrating your team chat with Redbooth means you can get an overview of your projects without pinging people incessantly. With the Redbooth Slack integration, you can get real-time updates of your project’s progress in Slack. 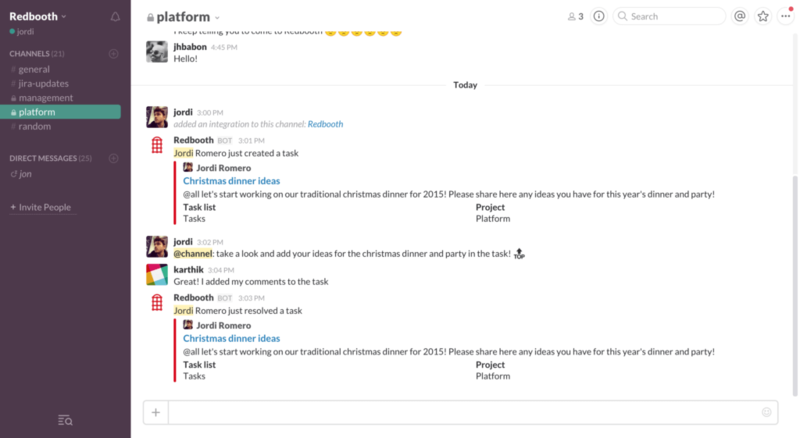 It connects Redbooth workspaces with Slack channels so you can see what tasks have been created, completed, and commented on. You can even connect multiple teams to one channel. You can then create and complete tasks directly from the chat room using a variety of commands. The WebEx Teams integration is a premium feature, but we’ll be happy to set up a demo for you. For agency and consultant teams, time-tracking is one of the best ways to measure work and prepare invoices. In Redbooth, you can use the native time-tracking feature for premium users, or you can use one of these three time-tracking integrations for different types of teams. The Redbooth Paydirt integration is a lighter-weight time tracker for freelancers, consultants, and small teams. The Paydirt Chrome extension allows you to track time spent on tasks in Redbooth and sends that data to Paydirt to generate reports. The Redbooth Clockify integration is a Chrome extension for Clockify, a flexible time tracker and timesheet app that also integrates with several other tools. In Redbooth, track time on tasks with just one click of a button. Then later, run time reports in Clockify. The Redbooth Hubstaff integration links your Redbooth workspace to a more in-depth time tracking, reporting, and payment platform. In addition to hours worked, Hubstaff also provides proof of work in the form of screenshots, activity levels, app/URL and location tracking so you can have full oversight on team activity. Sometimes you want a bit more control over your project management tools to make them fit your workflow better. For custom integrations and automations, you can use Zapier to connect Redbooth to a number of tools, no coding required. Right now there are 25 pre-made integrations available between Redbooth and Zapier. These zaps perform tasks that are common with Redbooth customers. For instance, the Google Calendar zap adds events to your Redbooth workspace as tasks to be completed by the calendar date. Zaps also make cross-functional collaboration more efficient, sending tasks back and forth between teams. Zaps between Redbooth and Jira, for instance, allow project managers to create development tasks and developers to create project tasks. 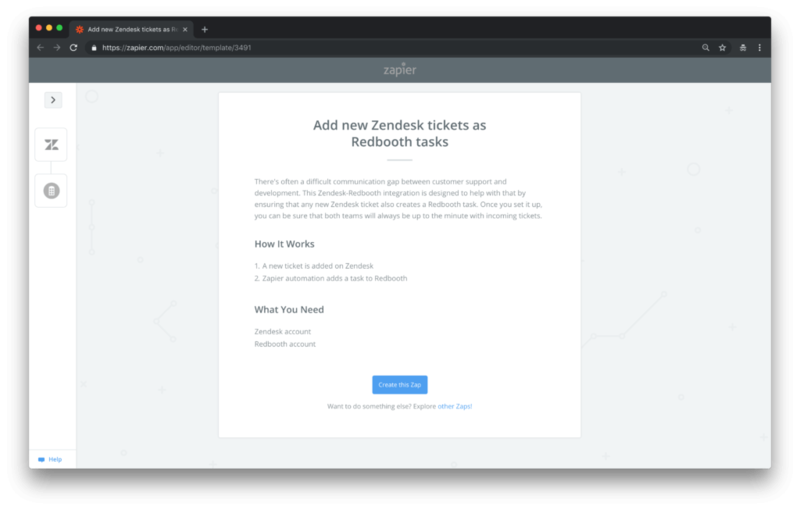 The Redbooth Zendesk zap allows support teams to add tickets to the marketing team’s to-do list. Creating zaps with these 25 apps is a simple process that just asks you to authorize permissions on both apps and then the new process will be implemented. You can also expand your zaps beyond the 25 pre-made integrations. Simply sign up for Zapier and select the tool you want to use with Redbooth. In the example below, the project manager sets up a zap to create a new task in Redbooth every time a client is added to their database in Airtable. Automation is a huge productivity booster, especially when it comes to recurring tasks. 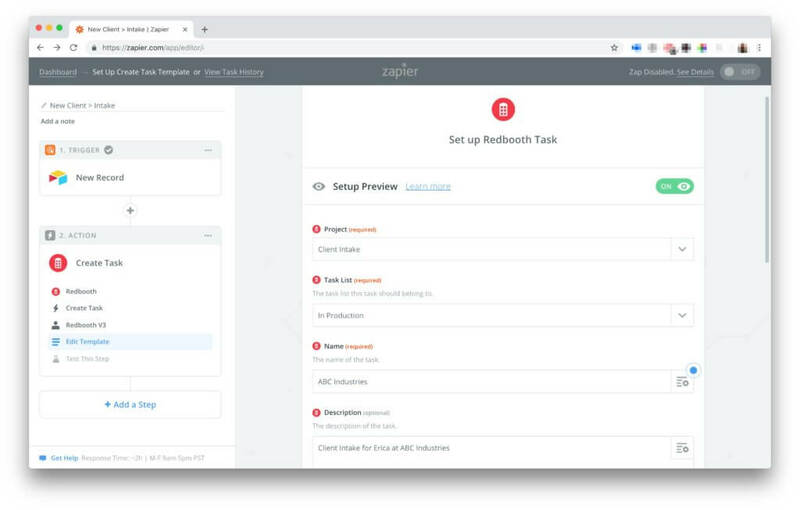 With Zapier, you can create tasks that will be visible across all services, making it easy for your team (and other teams) to see what needs to be done, take action, and move on to the next thing. Want to design your own project management tools from scratch? Have a unique problem that existing SaaS products simply can’t solve? For more advanced integrations, check out the Redbooth API. 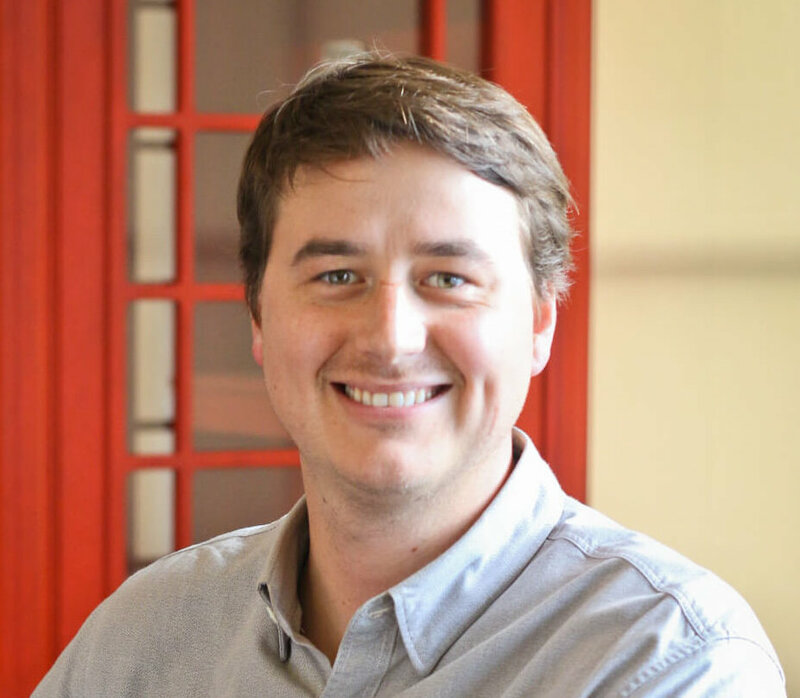 The Redbooth team will work with you one-on-one to discuss options for building your company’s dream productivity suite. 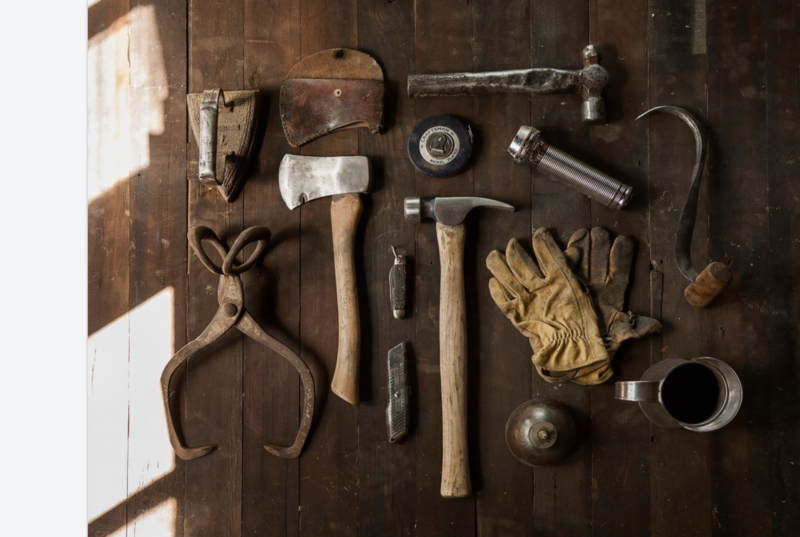 Ultimately, all these tools feed into your project workspace. By operating your project from a single workspace, you can monitor all the jobs your tools are doing. Not only that, but you can see how each moving part contributes to your larger goals and process. Once you’ve set your tools in action, you can refine their jobs and improve performance over time.